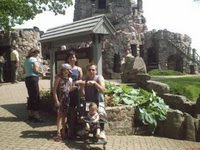 Last year we went to Alexandria bay to visit Boldt castle. Alexandria bay is an hour 19 minutes estimated distance 0f 75 miles drivefrom homeAlexandria Bay is accessible by crafts and boats provided by many boat tours . At the dock of Lower James Street we waited about half an hour for the boat to come back after touring the batch of tourists. 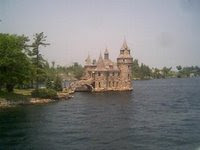 Boldt Castle is located on Heart Island in the 1000 Islands, Alexandria Bay, New York . Boldt Castle is the grandest of all Gilded Age Mansions and the setting of a tragic love story. 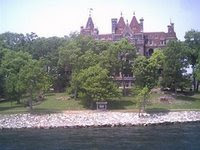 George C. Boldt a millionare proprietor of the world famous WaldorfAstoria Hotel in new York City set out to build a full sized Rhineland Castle in Alexandria Bay, on picturesque Heart Island. The grandiouse structure was to be a display of his love for his wife, Louise. Beginning in 1900, Boldt's family shared four glorious summers on Wellesley Island while 300 workers, stonemasons, carpenters, and artists fashioned the six stoy, 120 room castle, complete with tunnels, a power house, Italian gardens, a drawbridge, a nd a dovecote. Not a single detail or expense was spared. In 1904, tragedy struck. Boldt telegrammed the island and commanded the workers to immediately stop all the constructions. Louise died suddenly. a broken-hearted Boldt could not imagine his dream castle without his beloved. Three hundred workers laid down their tools. Boldt never returned to the island, leaving behind the structure as a monument of his love. 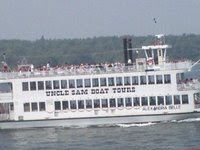 We explore the island through Uncle Sam Boat Tours. This international tour offers close-up enjoyment of historic and scenic wonders in both Canadian and American sections of the 1000 Islands. We cross the canadian water without worries of paperwork requirements such as visa, passport, birth certificates or anything like that. Aboard the cruise professional guides unfold historical river, the islands, and the magnificent homes that you'll view on this special tour. As we journey through narrow island passages, surrounded by the natural beauty of the islands, you'll marvel at the majesty, diversity and originality of the island homes. 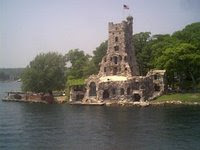 We get a close up view of the Alster tower, the Boldt' playhouse. It was the first structure Boldt erected on the heart island. This building was intended for the entertainment of guest and the Boldt family.Afterward we hopped out of the boat and explore the structures of the castle. We took this picture in front of the play house it look small outside but when you get in it is really big. So awesome, so unique. This is the power house and clock tower this facility was intended to house coal fired stream generators to provide electricity to the island.Visit http://www.boldtcastle.com/ for more pictures. 0 comments on "Bodlt Castle"